Consumer spending, still-fragile in the wake of the Great Recession,was easily shaken in recent months by the loss of economic momentum.Fading government support and another round of housing market weakness contributed to the deceleration, undermining business and consumer confidence. This, in turn, slowed the pace of hiring and retail sales growth. With government cuts continuing into 2012, particularly at the state and local levels, the onus largely falls onto corporate spending to reinvigorate the recovery. Total retail sales advanced 0.1 percent in June, erasing May’s decline but still reflecting consumers’ reluctance to increase spending. Additionally, reduced gas prices weighed on the overall retail sales figure but, if sustained, should translate into stronger discretionary spending in the second half. Core retail sales (excluding auto and gas) advanced 0.2 percent during the month, matching gains posted in April and May, but falling short of growth recorded earlier in the year. Despite the recent deceleration and lingering recessionary spending habits, retail sales have recovered from steep losses recorded between late 2009 and early 2010, with the June total exceeding the previous peak by 4.5 percent. Before a significant increase in spending takes shape, consumers and businesses need to regain confidence in the durability of recovery. 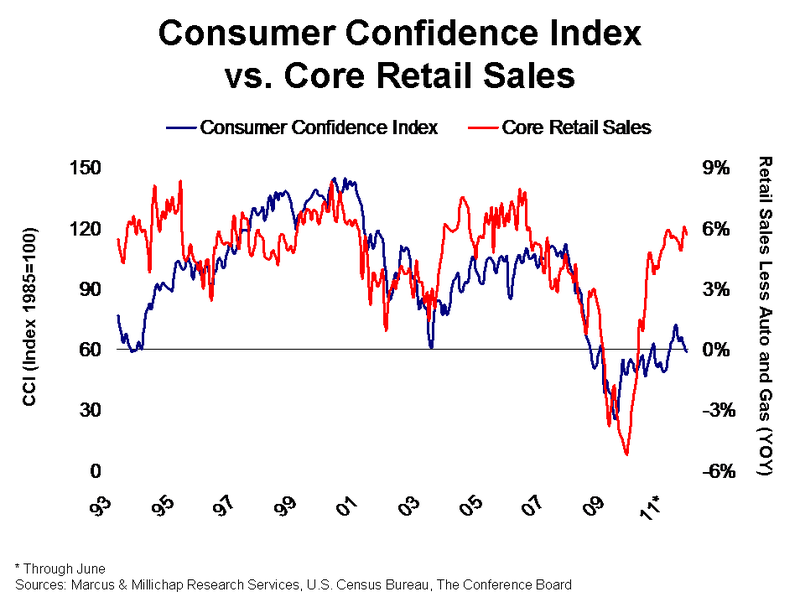 In June, consumer confidence slipped 3.3 points, building on a 4.3-point decline in May, positioning the index at its lowest level since last November. While consumers indicated reduced confidence in the present situation, the expectations component of the index fell more sharply, likely the result growing concerns surrounding the debt ceiling. margins, remains well equipped to accelerate hiring once confidence improves. Furthermore, banks have begun to ease standards on some forms of consumer credit, which will bolster spending through the next phase of recovery. During May, more than 20 percent of banks reported loosening standards on credit card applications, the strongest net gain reported since the survey’s inception roughly 15 years ago. While retail sales have surpassed pre-recession levels, vacancy in the retail property sector has inched down just 20 basis points from its peak to 10 percent. This can be attributed to steady increases in non-store sales, uneven performance across retail segments, and the addition of more than 400 million square feet of new supply since late 2007. Shopping centers brought online over the past three years, for example, post vacancy rates near 16 percent, while properties built seven to 11 years ago average just 7 percent. Hard-hit housing markets such Las Vegas, Phoenix and the Inland Empire, have been particularly hard-hit by this trend and will lag in an eventual recovery as a result. This entry was written by marcusmillichap, posted on July 16, 2011 at 1:12 am, filed under Research and tagged Retail Sales. Bookmark the permalink. Follow any comments here with the RSS feed for this post. Trackbacks are closed, but you can post a comment.